Boat Beacon now supports AIS and GPS from a VHF AIS receiver. Boat Beacon now allows you to use AIS and GPS NMEA data directly from an AIS receiver and GPS on-board your boat via WiFi (over UDP or TCP) or Serial(USB). 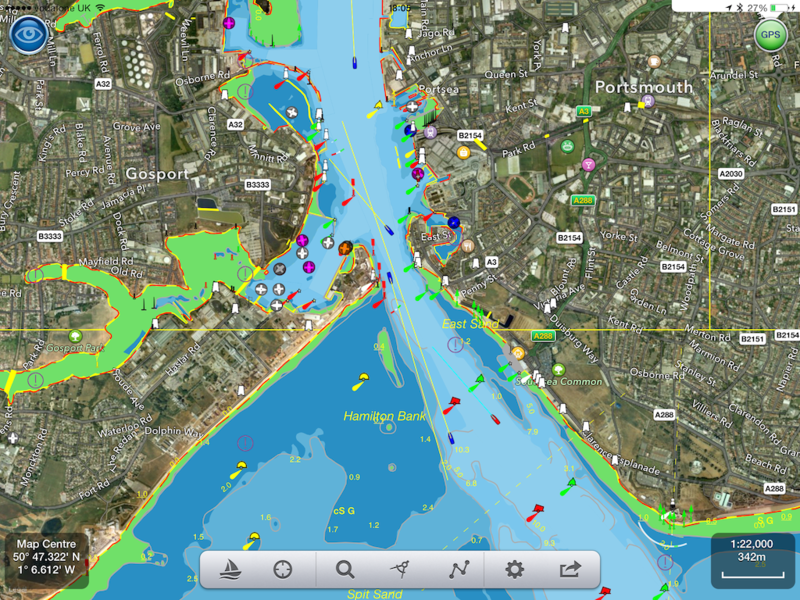 Boat Beacon seamlessly combines this with the AIS information it receives over the internet. If you travel outside mobile internet coverage or in an area where we don’t have good coverage from a local shore station, Boat Beacon can now continue to work displaying live ship data, calculating Closest Point of Approach (CPA) with alarms etc. from your VHF AIS receiver or AIS enabled VHF radio. On Android you can connect the NMEA serial or usb output from an AIS receiver or connect via WiFi. On iPhone you need to use WiFi. Here are some of the AIS receivers we have tested with Lowrance, Simrad, B&G, Digital Yacht, Comar NMEA-w2-Wifi, Weatherdock EasyAIS, Chetco Digital SeaSmart , dAISy AIS, Navico GoFree, Quark AIS (dual channel and usb stick) etc. More information on how to hook all this up is given below. iPhone and Android AIS and GPS over WiFi. If you already have AIS data available over Wifi on board then just enter the UDP port number (or ip address and port number for TCP) for the source and Boat Beacon will start using the data. With Navico GoFree and iPhone/iPad this is even more simple as there is a “GoFree” connect button in settings – just press and go. If you only have a usb or nmea output available you will also need a serial or usb to internet or Wifi adaptor. They range in price from $50 to $200. This is one example we have tested with at the $70 level – USR-TCP232-400 that we hook into our on-board WiFi hub. Boat Beacon will automatically launch and use local AIS data (and GPS if available) when a USB cable is plugged in between the AIS receiver and your Android device. You can set the USB mode on or off in settings in Boat Beacon. We also support many other serial usb drivers (see below). http://boatbeaconapp.com/ybw/app/usbtest.apk (just click on the link on your tablet to download the app). Tap the “eye” icon at the top left to switch AR mode on, then tilt your device up to see a live camera of the scene and boats around you. As you turn round and view buoys and ships, their name, range and bearing will popup when they are in the center of the view. You can also tap on them to get more information. Tilt back down to see the map view. Tapping the “eye” icon again turns AR mode off. You can pinch to zoom the map or camera views. In AR mode our unique “AR Lock On” feature lets you select a ship or buoy on the map view and then easily locate it in the Camera view using a grey arrow to tell you which way to turn to spot it when its not directly in view. 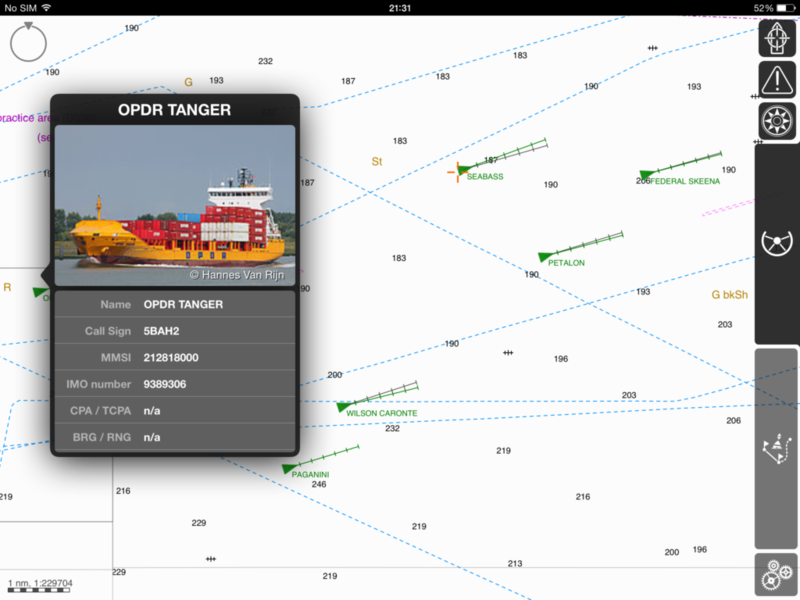 Your course (yellow line) and route to next waypoint (blue line) will also be visible overlayed on the camera view. Ships are color coded based on their type e.g. Sailing boats are white, Pleasure Craft magenta, etc. See the Map Legend for full details. A vector points forward showing where each boat will be in 2 minutes time based on its current Speed and Course. Ships move in real time across the map and in the AR view. 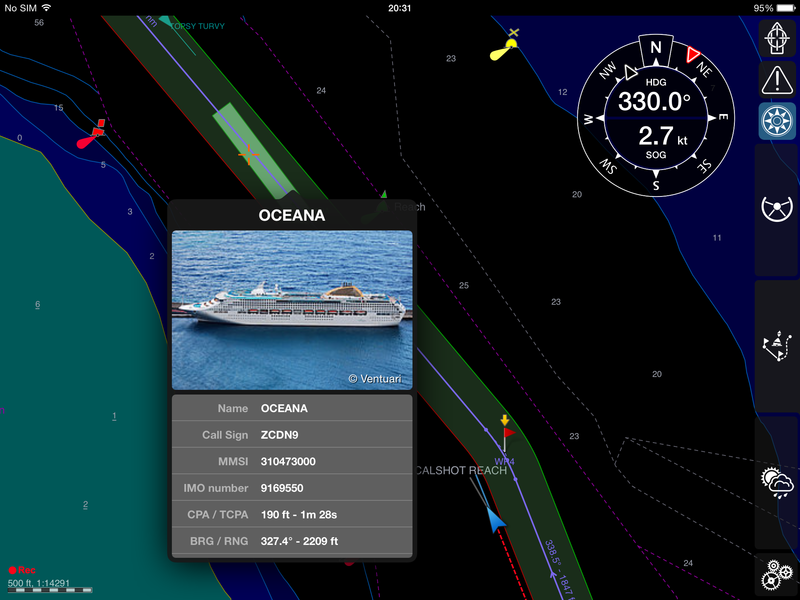 Tap on a ship or buoy to get more information and tap on the right arrow to get even more including speed, course, distance, bearing, picture etc. The horizon is set by the zoom scale of the chart view – e.g. zoom out on the chart view to see further out in the Augmented reality view.